The international boycott campaign against SodaStream came to the streets of Philadelphia on June 14, 2014 as Philly BDS and their allies protested stores in center city that stock SodaStream products. Upwards of a dozen spirited protestors gathered at the flagship Macy’s store located at 13th and Market Streets for two hours of in-store and on-the-street actions. With signs and informational postcards that read “Occupation isn’t green. Boycott Sodastream,” activists explained to passers-by that Sodastream is profiting from the theft of Palestinian resources and exploitation of Palestinian labor. It was perfect protest weather in sunny Philadelphia and the day proceeded according to plan yet beyond expectations. Protestors played musical instruments as they chanted “Burst the bubble!” and “Occupation isn’t green. Boycott SodaStream!” Postcards were handed out that offered additional information about SodaStream’s complicity in Israel’s apartheid regime and the ongoing occupation of Palestine. One protestor’s bubble-blowing added to the ambiance. A goal of the action was to explain the campaign to shoppers and local stores and to ask store managers to stop selling Sodastream. Toward that end, a few from the group went inside Macy’s to the third floor where Sodastream is sold. They found sales personnel and customers friendly and receptive to the boycott campaign information. Nicole Bindler, a performance artist and member of Philly BDS, staged a creative piece of performance art that included handing out olive branches to engaged onlookers. Then they struck gold. On a Clearance table, Sodastream machines were marked down to the considerably reduced price of $4.99 and,, in conversation with a manager, boycott activists were told that Macy’s plans to discontinue selling Sodastream products. 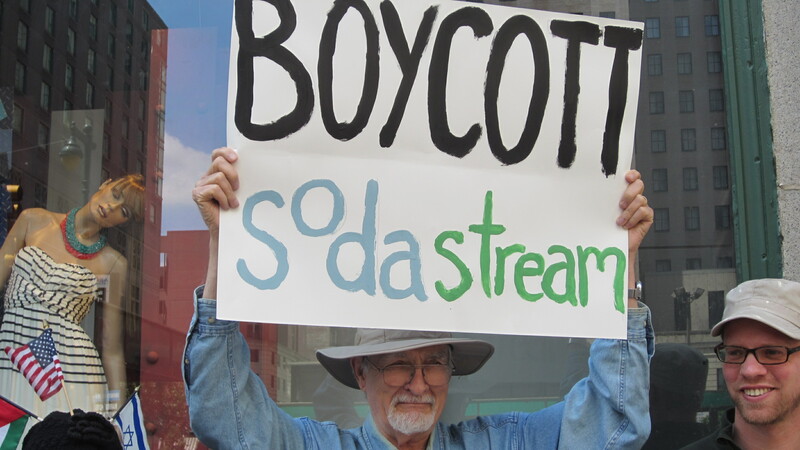 Overjoyed, the protesters spread the news – Macy’s plans to discontinue selling Sodastream! Visits to two other stores in the area yielded similar findings – Sodastream products were being sold on the cheap and cleared out. Dare we speculate? Is the international campaign to boycott Sodastream impacting the desire of retail stores to sell this product? SodaStream is the target of an international boycott movement because of its involvement in human rights violations against Palestinians. The company has marketed its product as an environmentally friendly alternative to traditional soda drinks. However, SodaStream main factory is in Mishor Adumim, the industrial area of the Israeli settlement Ma’ale Adumim, built on Palestinian land in violation of international law. The Israeli government provides economic incentives, including tax deductions, for businesses operating in West Bank settlements. In 2005, Palestinian civil society asked global civil society to develop campaigns of boycott, divestment, and sanctions (BDS) until Israel complies with international law and basic human rights. SodaStream has become one of the most high-profile targets of the international consumer boycott. Please join us and others across the world in refusing to buy the products of Israeli apartheid and in demanding that your local stores take them off the shelves!